As the summer keeps getting hotter here in the south, I am looking more and more for indoor activities to keep my son occupied. As a result, one of our favorite places has become the bowling alley (www.kidsbowlfree.com). My son LOVES bowling, and at two years old is getting strikes and spares, knows what splits and gutter balls are, and loves to figure out how many pins he has left to knock down in the frame. We have been going twice a week this summer, and I have been witness to many kids in the bowling alley over the last two months. Throughout my unofficial observation process of kids and their bowling endeavors, I have made note of several connections and thought they were worth sharing. 1. Kids who are praised are more likely to be frustrated when they do not succeed. 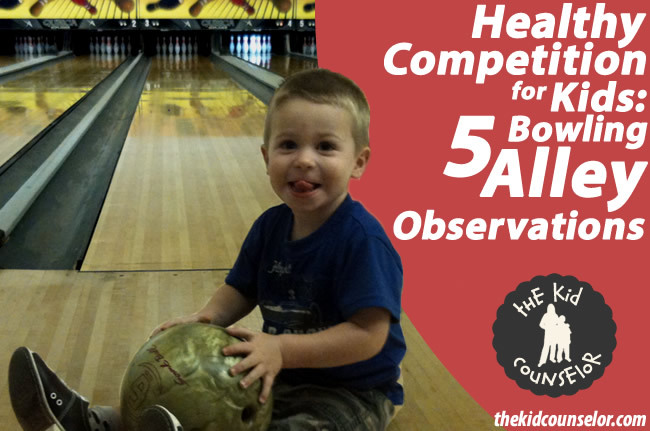 Kids who are told, “Good job!” or “That was awesome!” when they do well are more likely to feel very defeated when they get a gutter ball. These are also the kids whose parents tend to talk a lot about their child’s scores, such as “You are beating XXXXXX” or “You are doing better than me”. This puts the focus on the outcome, rather than the effort or the process of bowling. For more information about the difference between Praise vs. Encouragement, read more here. 2. Kids who cheer for others are typically content with their own performance. Children who watch other bowlers and can genuinely share in the excitement of a strike or spare are more likely to feel a sense of accomplishment with their successes AND failures. I believe this is probably because kids who have been shown how to encourage others are not dwelling on their own bowling to the exclusion of enjoying the experience. 3. Kids whose parents ignore mistakes inadvertently create children out of touch with the real world. If kids never hear the facts about their actions, both good and bad, they do not fully understand how the world works. In other words, if parents with good intentions only acknowledge when pins are knocked down rather than when the pins are left standing, there is no balance for the child. This leads to a false sense of accomplishment and a reduced self-awareness for ability and competence. 4. This generation of kids gets very little genuine competition, thereby creating feelings of entitlement. We have supported and accepted a new environment for children that rewards everyone with a trophy for merely participating and we have eliminated MVP and performance-based awards to be “fair.” The reality is that the world does reward performance and success, so everyone will not always do well just because they try. Bowling is no different – practice, hard work and training make you better. Kids often think they should get strikes on their first visit, which is a belief that should be corrected. 5. Kids who do not have their feelings validated and reflected are very unhappy as they bowl. a) Why are you acting like this? What is wrong? b) You are doing great! Don’t be upset. c) I am going to stop bringing you if you always act like this every time we come. While these approaches are in an attempt to correct the behavior, the reality is that kids are acting this way to communicate their feelings. Kids do not have the verbal ability to express feelings until puberty, so acting out (pouting, complaining, crying, whining, etc.) is their way of expressing their emotions. By telling them to stop acting that way, it is essentially telling them their feelings do not matter. Instead, parents who reflect their feelings back to them (“You are really upset that you didn’t knock all of the pins down” or “You are frustrated with your score”) make them feel understood, heard, and validated. This helps them understand their feelings and prevents outbursts and unnecessary meltdowns at the bowling alley. Read more about Reflecting Feelings here. It has been very interesting to spend so much time in the bowling alley lately, especially since I have improved my best score by 70 points! But more importantly, I have been reminded of what I already know by watching kids struggle to make sense of winning and losing, how to express themselves and how to gain a sense of accomplishment even when they fail. I hope these nuggets will help you set your children up to succeed at bowling, or anything else they choose.